Description: Exceptional, carefree living in this stunning top floor condo at the tc commons with open floor plan, 2 bd’s, 2 baths, plus 248 sq. 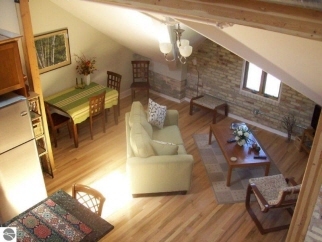 Ft. Loft area. Great view of the historic front lawn & distant west bay views. Great layout in this unit, no wasted space. 3 skylights for plenty of natural light. Island in kitchen is granite. Master bath has porcelain tile. Common floor laundry on every floor. Live among restaurants, shops & galleries. 380 acres of parkland surround the commons. Pets welcome. Short term rentals allowed. Beaches, downtown tc 1 mile away.